I wish this book had been around when I was homeschooling! I regularly searched for “live” books based off historical events in an effort to stimulate reading pleasure in my son. 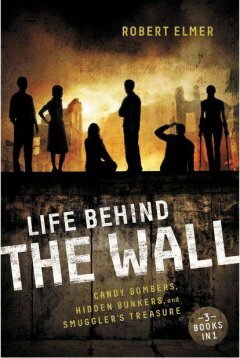 I loved this book, which is actually three short books in one — Candy Bombers, Hidden Bunkers, and Smuggler’s Treasure. It is very well-written, imaginative, informative, and touching. It deals with life surrounding the Berlin Wall in Germany, from its beginning to its tearing down. The up close and personal views of the people that had to live during those times on food rations, with prejudice and learning how to recover from the war was eye-opening. The characters are thirteen in all of the stories. They are relatable and real and make you want to reach into the book to give them a hug at times. It was the first time I’d ever really given much thought to the suffering of the German people during those times. I loved the large print in this book. For a younger reader, this makes it easy to speed through the pages and to feel accomplished as a reader. This book is a win-win for homeschoolers and for middle school boys especially.